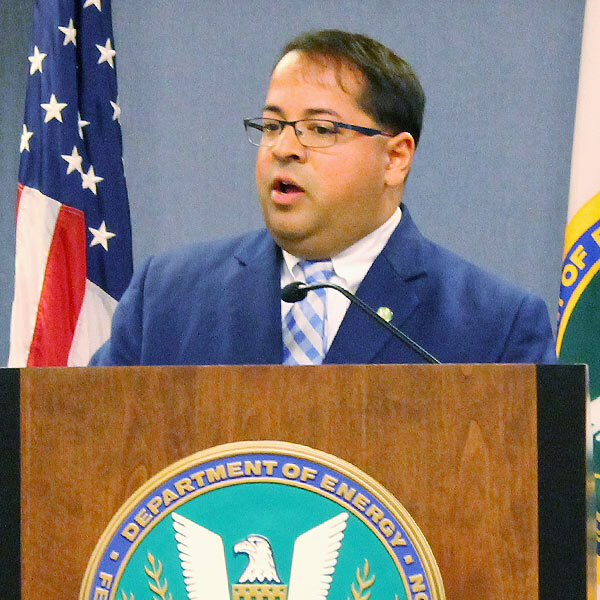 WASHINGTON — FERC Chairman Neil Chatterjee on Thursday praised former Chief of Staff Anthony Pugliese, denying there had been any conflict between the two but also staying mum on the reason for his departure from the commission. “I want to thank Anthony for his friendship, for his willingness to serve the agency and the country, and we wish him well in his future ventures,” Chatterjee said at the beginning of the commission’s monthly open meeting. Chatterjee was reluctant to talk about the circumstances around the departure. But, he said firmly, Pugliese “was not asked to leave.” He declined to comment on the search for a replacement. Pugliese told Politico on the day of his announcement that he had been planning on leaving since Commissioner Kevin McIntyre’s death in January. A former lobbyist in Pennsylvania’s capital and an unsuccessful state legislative candidate there, Pugliese had served as chief of staff since August 2017, before the arrival of McIntyre as chair in December of that year. He stirred controversy last July for remarks he made at a conference of the American Nuclear Society and on the “Breitbart Radio Show,” in which he praised Trump and criticized Democratic governors for blocking pipelines. Asked if his relationship with Pugliese had “deteriorated,” Chatterjee responded, “Look, Anthony is a personal friend of mine, and I don’t agree with that characterization.” He also declined to say what, if any, disagreements led to the resignation, repeating that Pugliese was a friend and that he wished him well. Chatterjee also said he had never had any conversations with the White House during his nomination process about the Trump administration’s push to bail out uneconomic coal plants. The question came in response to a Politico article published Tuesday reporting that Trump had dropped plans to nominate former NRG Energy General Counsel David Hill to fill McIntyre’s spot after pressure from Energy Secretary Rick Perry and coal company executives Joe Craft and Robert Murray. Hill, who was DOE general counsel under former President George W. Bush, had opposed the DOE’s effort to support coal generators. “The entire portfolio of generation assets in the United States could be eligible to be part of a reserve, with different strategic weights placed on various types of generation — for example, nuclear or coal-fired generation might provide greater resilience benefits and therefore be preferentially selected into the reserve,” the report says.